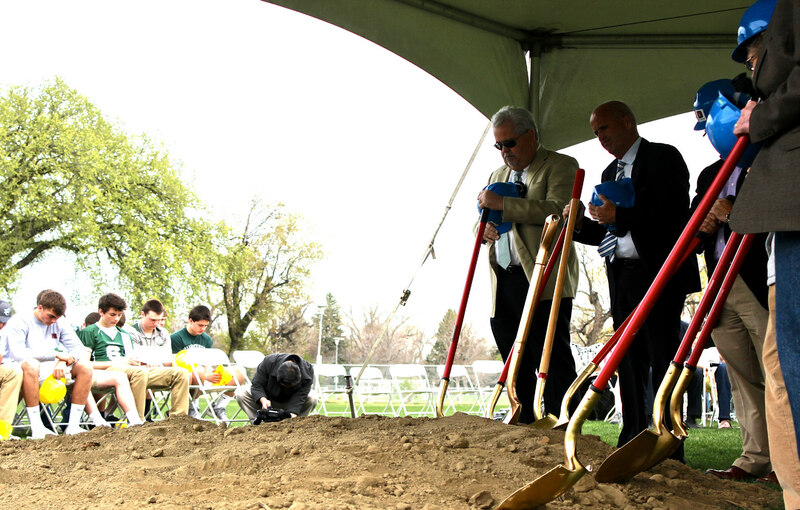 On April 9, one of Rocky Mountain College’s long-term dreams came true when ground was broken for a new science building and football stadium. The project, called ImpACT Today, Transform Tomorrow, came to fruition in early November 2015, when RMC’s Board of Trustees approved breaking ground for the renovation and expansion of the RMC science center and football stadium. “Rocky Mountain College is embarking on one of the largest capital projects in its history, one which will provide unparalleled benefits for future generations of students,” stated RMC President Dr. Robert Wilmouth. About 100 people came to join the ceremony, during which President Wilmouth, athletic director Bruce Parker, and RMC Chaplain and Director of Spiritual Life Kimberly Woeste, gave speeches to commemorate the occasion. “This is a defining moment in the history of Rocky Mountain College,” said Wilmouth. He described how students themselves were an essential part of building the original college, which was “… built of sandstone rocks brought down from the [Billings] Rims.” He stated that the students constructed new buildings as a way of paying their tuition; they were taught to be leaders, just as today’s RMC students are. To support students, the project will include a new science building, which is going to be an “international space center,” where future students have a “good place to develop their future education further,” stated the leader of the ImpACT Today, Transform Tomorrow group. The center will include a new lab addition, new parking lot, new classroom level, existing building roof replacement, and new furniture. This renovation and expansion of the Bair Science Center will enhance the classrooms and equipment of every RMC student regardless of major or discipline. Every student can take advantage of this great innovation. This new building and field will hopefully inspire students and student-athletes to also be successful in the future. Next to the educational expansion, the Herb Klindt Field will also undergo changes to an enormous extent. The enhancements will include field turf and lights which will transform the field into a multipurpose facility and also allow RMC to host night games. The ground is now broken and we are looking forward to see the development of the project. The campaign of ImpACT Today, Transform Tomorrow said the football stadium renovation is estimated for August 2016, and the whole project will be complete by Fall 2017 with the expansion and renovation of the Bair Science Center. This entry was posted in Vol 3 Issue 12 and tagged Bair Science Center, Board of Trustees, Groundbreaking, ImpACT Today, Lea Hippaf, Nico Cordero, Transform Tomorrow. Bookmark the permalink.